The annual festival of chocolate over-indulgence known as Easter raises more serious issues than pimples and weight gain for the ethical shopper. The cocoa trade is notoriously bedevilled by child labour, slavery and other workers’ rights issues. Palm oil, which can be used in confectionery listed merely as ‘vegetable oil’, is rarely produced sustainably, and that industry is linked to deforestation and related habitat degradation, indigenous human rights abuses and climate change. 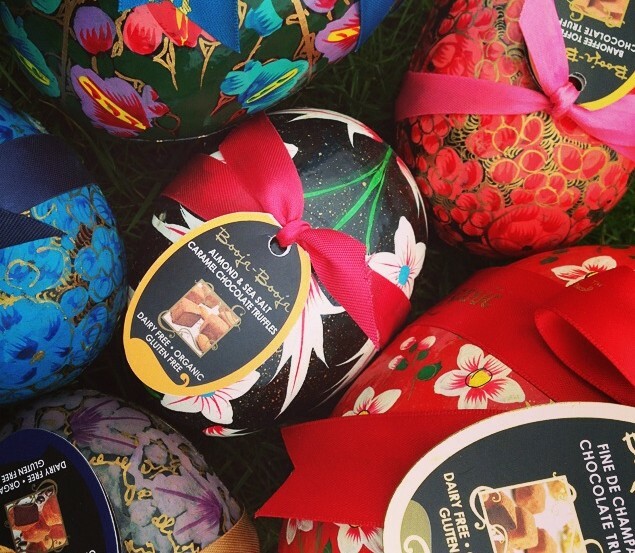 And Easter eggs are at least as much about packaging as chocolate. You’ll still get more chocolate for your money, and generate less packing waste, by buying a big bar. To avoid irresponsibly-sourced ingredients, look out for actively sourced fair and sustainable cocoa with Fairtrade, utz or Rainforest Alliance certification. Since it’s not essential, most of the big players have banished palm oil from their products, yet despite a published commitment to source only Certified Sustainable Palm Oil by 2015, Mars has yet to produce evidence unsustainable oil has been removed from its supply chain. In recent years, most confectioners have reduced the packaging on their eggs in response to consumer pressure, and the moulded plastic frontage is no longer a given. Look out for minimal designs made from recycled card. The scrupulous currently avoid all the big names. Even once reliable Green and Blacks, now owned by Mondelez foods via Cadbury’s, are not what they were. Fortunately there are several fabulous brands which you can buy with confidence. The most commonly available sustainable option is now Divine Fairtrade, and people who like their chocolate sweet and creamy love it. An ethically-motivated company, 45% owned by cocoa farmers and with a good record on supply chain management and environmental reporting, it will never use palm oil and is committed to using only certified Fair Trade ingredients wherever possible. Why not treat a sceptical friend to a bar of 38% Milk Chocolate with Toffee and Sea Salt, voted Britain’s favourite fairtrade product of 2014 in a Fairtrade Foundation 20th-anniversary public poll. Their gift box of ten bars also includes other gourmet delights like 70% Dark Chocolate with Hazelnut Truffle and White Chocolate with Strawberries, or they do a range of chocolate eggs to appeal to all ages. You should be able to find Divine across Europe, in the US and Canada and in Australia, South Korea and Japan. Equally sound ethically, this multi-award winning Norfolk company makes Soil Association and Vegan Society certified organic, vegan and even gluten- and soya-free luxury truffles to delight the most sophisticated palate. They’ve even found the best answer I’ve seen on the packaging conundrum. 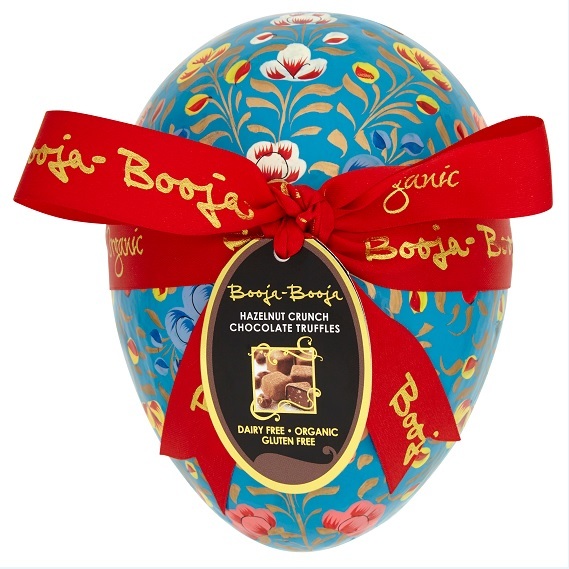 Each of their gorgeous truffle varieties can be bought in a covetable papier-maché egg-shaped trinket box, hand-painted by Kashmiri artists, and minimally finished with a ribbon and a tag. Choose from everything from Banoffee to Espresso truffles. The Champagne variety, ‘deliciously boozy’ and melt-in-the-mouth, were the favourite of Guardian taste testers for Easter 2010. For the really serious chocolate lover, how about a few of their 100% dark Ecuadorian raw chocolate truffles? They won’t need many! You can buy Booja Booja in Waitrose or Holland and Barrett, and across Europe, in Australia and internationally via Suma healthfoods. Still not quite what you’re looking for? If money’s no object and you’re in the UK, pop into your local Hotel Chocolat for quirky, imaginative, mind-blowingly delicious Easter treats made from chocolate sourced via their own ethical growing programmes in Ghana and St Lucia. 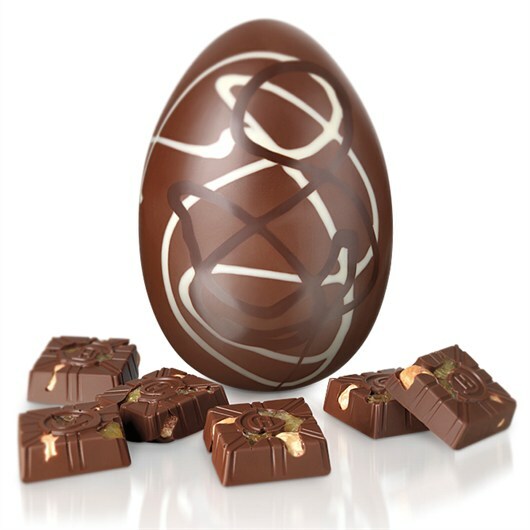 The range caters for everyone, with specialties including grown-up, treat-filled hollow eggs with extra-thick shells, fun chocolate ‘egg sandwiches’ and a plain silly chocolate slab featuring a white chocolate smiley with ‘fried egg’ eyes. Their website serves the UK, Australia and Denmark. I had been meaning to post since Easter, to say thank you..I read your post in time to get the ‘right’ chocolate eggs for the occassion. I actually purchased from Hotel Chocolat (which was delicious, and everyone loved) and was excited to remember that Hotel Chocolat was available close to home….but then to my disappointment I came to find out it had closed….I believe that it lost business partly because no one truly knew the value of the chocolates that were on sale…they saw the hefty price tag and questioned “what makes thier chocolate so different that it warrants such an expensive price! ?” …. Messages communicated by brands such as Hotel Chocolate are not reaching the larger audience…instead they are only ‘preaching to the converted’ and unfortunately that’s not a large enough group at the moment….